Academic researchers must be persistent and clearly resilient -- an adjective that is being applied to everything from critical infrastructure networks (transportation) to organizations. Academic researchers submit articles for publication in journals, which are peer-reviewed. After months, if not years of work, a paper is submitted, and then one waits (I have even waited for over a year) to get the reports on the paper back. Sometimes the news is fabulous -- publish as is! Sometimes the news is very good -- minor revision only needed. Sometimes it is lukewarm -- major revision needed and then you hope that it ultimately hits, but you may need to go (my record is 4 revisions) through multiple revisions. And sometimes one gets the dreaded news -- outright rejection. Yesterday, yes, on a Sunday, I had a discussion with an Editor -- I am serving now on over a dozen journal editorial boards and also do (alot) of reviewing of articles. Part of the correspondence from the Editor had the following phrase in it to me: Understand, I cannot accept a paper with negative reviews (even if it is submitted by a Nobel prize winner). Since I love the history of science and am also very persistent I did some research. I admit that I had heard comments over the years that some scientists had had their major work rejected, which then went on to garner them fame (if not fortune). I wanted the evidence. This is what I dug up, which I think is very illuminating. An editorial in Nature, a top scientific journal, which you can access here, stated that it had celebrated the 2003 Nobel in Medicine awarded to Paul Lauterbur, only to have him remind them that the paper had been first rejected and then he appealed the decision. I also discovered this great article: How Are the Mighty Fallen: Rejected Classic Articles by Economists by Gans and Shepherd in the Journal of Economic Perspectives, which was based on a survey of 140 leading economists including Nobel Prize winners and Bates medal winners. Paul Samuelson, the Nobel laureate, acknowledged rejections of some articles of his that are classics. Many "let off steam" in relating their rejection experiences, according to Paul Krugman, quoted in the article, who later went on to also get a Nobel prize in Economic Sciences, as had Samuelson. The article has a list of articles and their authors that were rejected and where they were eventually published. The Nature editorial concludes with: Nevertheless -- a final moral -- rejected authors who are convinced of the ground-breaking value of their controversial conclusions should persist. A final rejection on the grounds of questionable significance may mean one journal has closed its door on you, but that is no reason to be cowered into silence. Remember, as you seek a different home for your work, that you are in wonderful company! Yesterday was a very special day for the University of Massachusetts Amherst. 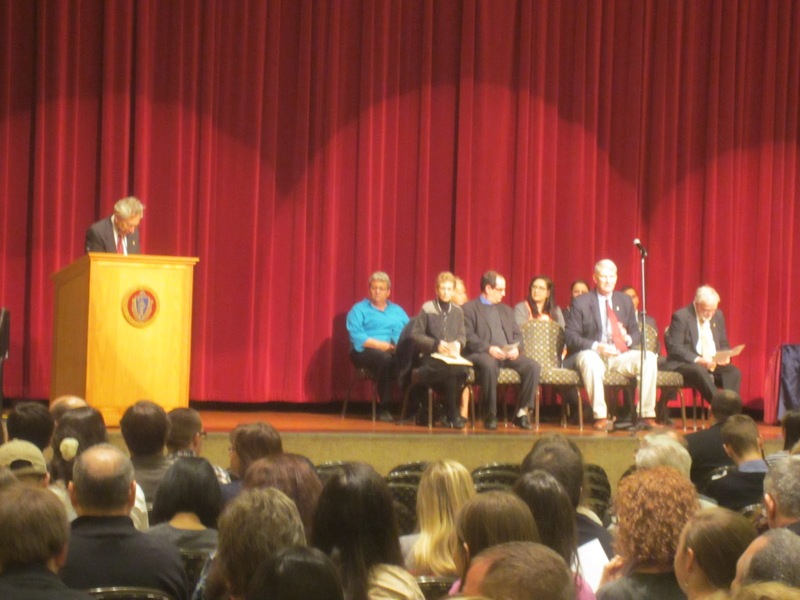 Not only did we inaugurate Dr. Kumble Subbaswamy as UMass Amherst's 30th Chancellor at the Mullins Center with many dignitaries, faculty, administrators, and special guests in attendance. 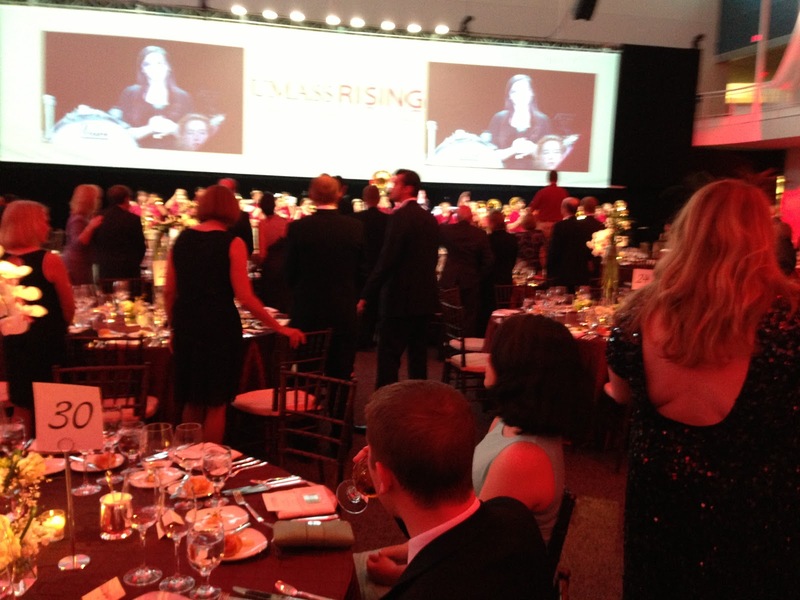 but we also celebrated UMass Amherst in a gala event last evening. 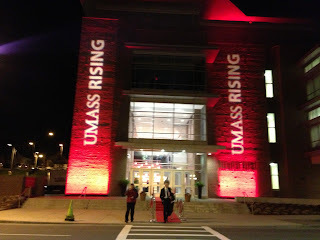 The theme was that of UMass Rising. 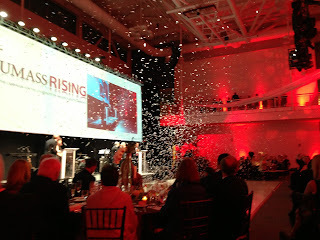 The venue was our new recreation center which was transformed, complete with a red carpet, into a beautiful room with lights, white draperies, flowers, and a delicious dinner due to the UMass Amherst award-winning chef, Ken Toong. 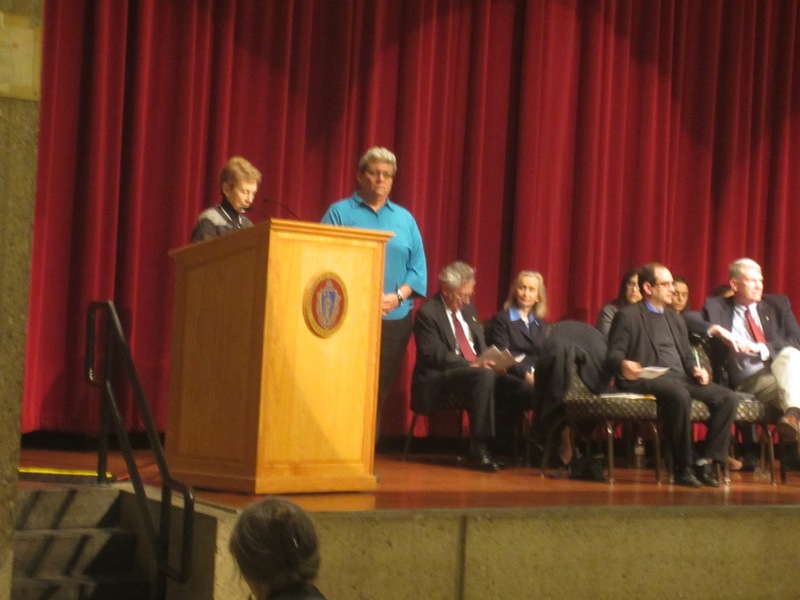 The masters of ceremony were 2 nationally renowned UMass alums -- attorney Kenneth Feinberg and the astronaut Cady Coleman Both spoke eloquently on the role of the education that UMass Amherst provided in their success. Feinberg was an undergraduate at UMass whereas Coleman received her PhD at UMass. She took a Minuteman (UMass mascot) statue with her to outer space where she spent 6 months and it traveled 93 million miles with her. Feinberg singled out faculty that he had had as a student who were his mentors and also noted his dear friend, Bob Epstein, who was also present at the gala. We heard from President of the UMass system, Dr. Caret, our new Chancellor, and the Chair of the UMass Board of Trustees, .Henry Thomas III. We were entertained by musical groups and a student group acting out some highlights of the 150 year history of UMass Amherst that we are celebrating this year. A video with music highlighted the impact that UMass Amherst has made on students' lives and the importance of supporting this great institution. A college degree transforms a life and accessibility and affordability are essential. UMass Rising is the theme of the ambitious campaign to raise $300 million for schol;arships, endowed professorships, enhanced infrastructure, research support and more. I returned a short while ago from NYC where yesterday I took part in an extraordinary conference -- The New York Times 2013 Energy for Tomorrow Conference. The full agenda of the conference can be accessed directly here. It was an intellectual feast that brought together mayors, an Academy Award winner, thought leaders, scientists, environmentalists, investors, policy makers, and decision-makers, corporate employees from IBM to Google, as well as a farmer/former NBA player/MacArthur Fellow -- and these were just some of the speakers. In the audience, I met a colleague from Cornell (now retired), a diplomat from the Chinese embassy in DC, a Georgia Tech professor, numerous journalists from as far as Singapore, affordable housing advocates, urban planners, students, a researcher at MIT, head of the electric vehicle taxi program for NYC, and a financier in private equity, to single out just a few. The conference began with a stimulating breakfast session (the food was good, too) on smart vehicles, but time was too short for me to be able to ask the question that I had -- what about cybersecurity issues in this product domain? I was thrilled that even operations research was mentioned -- indeed, where would transport studies be without OR?! Mayor Michael Bloomberg of NYC, who needs no introduction, was introduced by Arthur Sulzberger Jr., the publisher of The New York Times, and both were absolutely brilliant. With the paralysis in Washington (Congress) regarding environmental action, mayors and cities are leading the way. This is the first truly urban century and cities have to (and many are) taking action. We must unlock human creativity and take actions to mitigate risk. 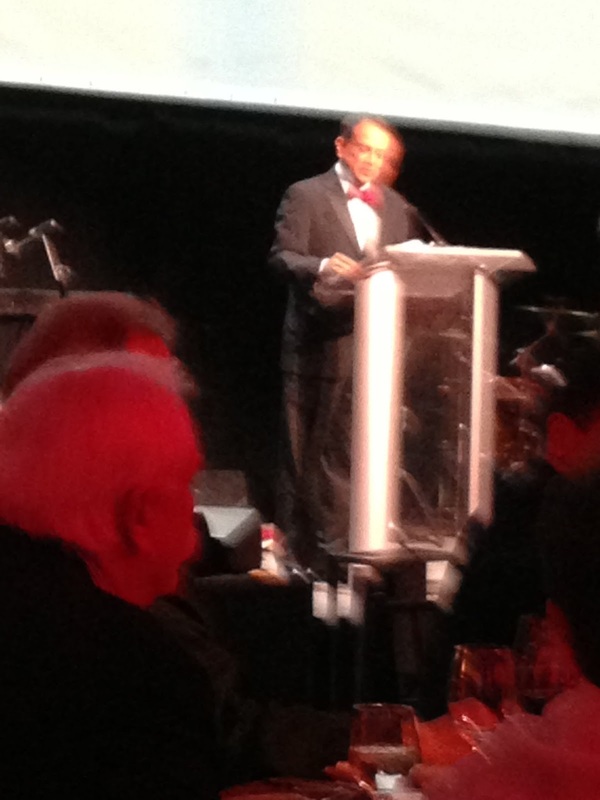 Mayor Bloomberg chairs the C40 group, which actually consists of 60 cities. Mayor Bloomberg had 4 major points with the first one being that one must develop a plan with goals and metrics -- you have to be able to measure. He has done much to improve air quality and water quality and, along with the Sierra Club, has been instrumental in retiring many coal-fired power plants. 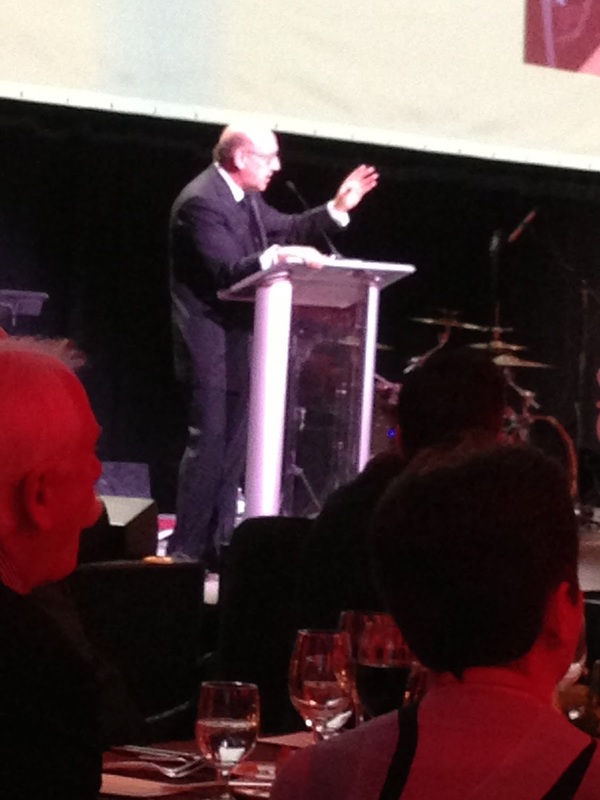 750,000 trees have been planted in NYC with a goal of planting 1 million and he gave credit also to Bette Midler. He noted how sustainability provides good economic value -- being environmentally friendly improves your brand and helps in recruiting -- vibrant, smart employees want to work in places where they can breathe clean air! He mentioned how he, with Al Gore (former VP and of the An Inconvenient Truth fame), climbed up on a rooftop and painted it white -- with white rooftops reducing energy costs by 20% -- a quick payback. He also emphasized private-public partnerships -- closing roads to traffic -- something I have written about, spoken about, and even been interviewed on, and how we should be stealing the best ideas in terms of transport and sustainability from around the world. What really intrigued me is when he said that China will become a leading environmentalist in the next 10 years He, as several others yesterday, emphasized resiliency and that we must prepare for extreme events. Hurricane Sandy was noted several times during the conference. The next panel was the Mayors panel and the panelists were engaging, and very entertaining with one of my favorite quotes being "cars are the next cigarettes." The theme that people will vote with their feet (want to live and work in a sustainable location) continued. We were then treated to a conversation between Andrew Revkin and Jeremy Irons, who has garnered not only an Academy Award, but numerous other awards for his acting. His passion for the environment resonated as did his eloquence. The night before the conference, the movie Trashed, which he was the Executive Producer of, was screened, and more info on what is being done to our globe because of garbage can be found here. He noted that he is using the actor's power to address important problems and even emphasized electronic recycling and packaging -- his knowledge impressed me. He noted that a film can inject a feeling of purpose. He also emphasized that it is about education and that industry should prove that what it is making is 100% safe. Since my research group does a lot of work on sustainable supply chains his message was near and very dear to me. Coincidentally, Revkin is a fellow Brown University grad and I heard him deliver the Daffodil Lecture at UMass a while back. Thomas L. Friedman of The New York Times then led a panel on renewable energy with experts from the US and abroad, including the CEO of ConEd, Kevin Burke. Joe Nocera, also of The New York Times, followed with a panel on the role of technology and innovation and I was especially moved by Stephen Kennedy Smith, who spoke on agribusiness and urban food supply. I managed to talk with him later and mentioned that when I got my PhD from Brown his nephew, John F. Kennedy Jr., received his undergraduate degree. 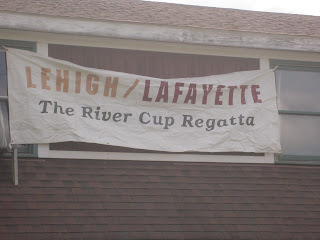 There are also other school ties which I noted. During lunch, we ate (a very healthy spread) and discussed the urban food supply and since one of my most recent papers was on competitive food supply chains (with Min Yu), which was published in the European Journal of Operational Research, this topic was mesmerizing. Will Allen, the Renaissance man -- farmer and MacArthur Fellow, regaled us with his work in inner cities and urban farms. I had to then take off since it was time to get ready for the Transport and Traffic panel that I was speaking at, which was moderated by Joe Nocera, and I had terrific company! Below are several of my fellow panelists as we get ready in the "Green" room which actually had a red door. The day concluded with breakout sessions in which we brainstormed and a closing session Dealbook: Investing in the city of tomorrow -- provocative and timely. The conference was videostreamed and you can access the videos of the various panels on the conference website. The Transport and Traffic panel that I was part of can be accessed directly here. I had to bring in the Braess paradox into the conversation as well as congestion charging and transport congestion policies dating back to Roman times -- when chariots were the problem! And I could not resist posting photos below taken of me with Professor Richard Schuler, professor emeritus of Cornell, and of Dr. Yajun Fang of MIT taken at the reception at the end of a very exciting day. Professor Schuler is the academic father of Professor Ben Hobbs of Hopkins, an INFORMS Fellow. New York City was as vibrant, exciting, and stunning as always and I share with you the additional photos that I took while walking as a very happy pedestrian in NYC! And, on the way back to Massachusetts, via Amtrak on the Vermonter, as I strolled back to the dining car for a cup of tea I heard a greeting --"Hello, Anna!" and it was one of my favorite Isenberg School of Management colleagues, Professor Glenn Wong, of sports law and sports management fame. This week is Earth Week and tomorrow, in NYC, The New York Times is hosting the 2013 Energy for Tomorrow Conference with the theme Building Sustainable Cities. I am very much looking forward to taking part in this event and hearing experts on energy, sustainable buildings, urban food supply, technology, and transport and traffic speak and discuss how we, together, can achieve more livable cities in this century. Janette Sadik-Khan, NYC transportation commissioner. I plan on discussing the (in)famous Braess paradox in which the addition of a new road may make all travelers/drivers in the network worse off in terms of an increase in travel time as well as the milk run freight paradox, where increasing the load factor (as often used by policy-makers as a means of improving freight efficiency), under certain conditions, can increase total costs and total emissions. The latter was discovered by Niklas Arvidsson, a doctoral student at the School of Business, Economics and Law, where I hold a Visiting Professorship (as part of my sabbatical this year from the Isenberg School of Management at UMass Amherst). I will also be highlighting the importance of supply chains and city logistics for sustainable cities. This is a topic that I am passionate about and my most recent accepted paper, "Design of Sustainable Supply Chains for Sustainable Cities," is in press in the journal, Environment & Planning B. The full agenda of the energy conference can be viewed here. Now is the time that many high school seniors are making, along with their family members, difficult decisions as to which college/university to matriculate at. It is a time of some stress, serious decision-making, but also a time, hopefully, about excitement for the future in terms of new experiences and a wonderful higher education. Now is also the time of second visits to campuses for accepted students and the beauty of spring season is surrounding us. 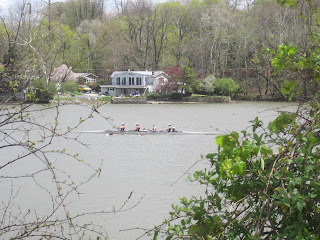 Last weekend, I was at my husband's undergraduate alma mater, Lafayette College, which is located on a big hill (aren't many colleges, it seems) in Easton, PA, which is about an hour from Philly and from NYC. My alma mater (4 degrees worth) is Brown University and I met my husband there when he was a PhD student in physics and I was an undergraduate -- yes, he is smart! 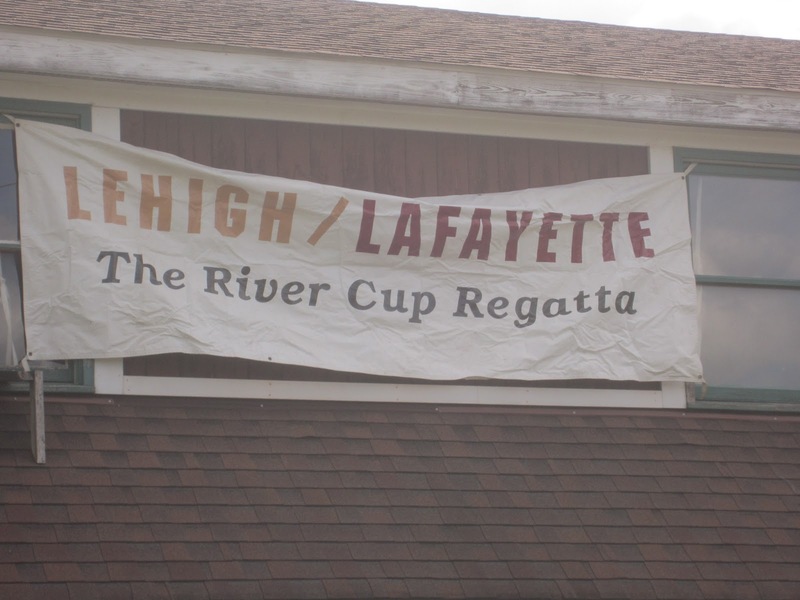 And, speaking of smart, another set of rankings, posted in Forbes, has Lafayette in the top 25 colleges with the smartest students, at number 22, along with many of the usual suspects -- Harvard, MIT, Stanford, U. of Chicago, etc. 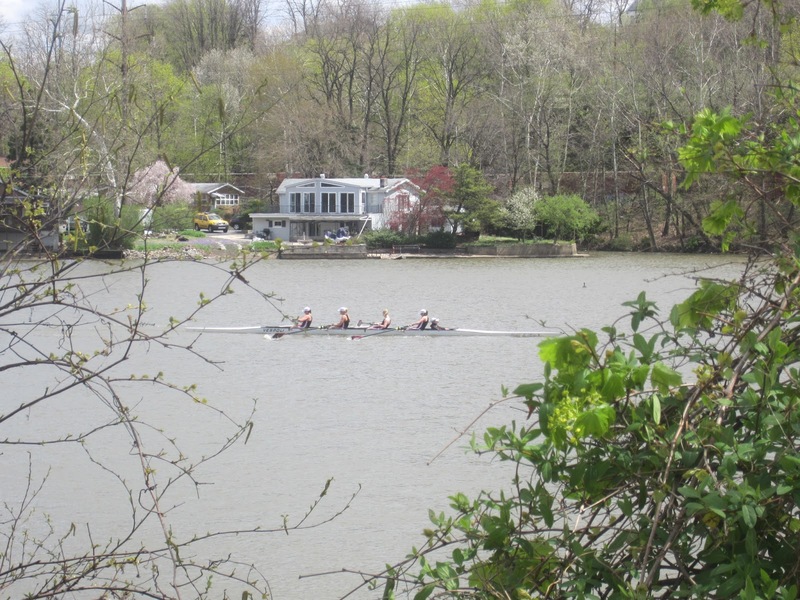 Forbes' own ranking with nice photos of college campuses can be accessed here. Lafayette College is unique because it combines liberal arts with excellent courses in engineering and science with faculty working closely with students -- hard to be absent from a class when the faculty know you and my husband still stays in touch with a former physics faculty member of his who lives in Easton but has retired. There has been a lot of discussion lately as well as press regarding college choices -- in terms of cost, quality of education, and even the value of life-long networks. I blogged a while back about Zac Bissonnette's book, Debt-Free U. The incoming President of Lafayette, which was established in 1826, is Dr. Alison Byerly, and she will be its first female President. She wrote a great recent column in InsideHigherEd. I believe that the value of a residential college campus experience and education is huge besides the courses, research experiences, and extracurriculars, including sports and community service, that one can engage in there are numerous opportunities for leadership. The 4 year undergraduate experience is special and US educational institutions are renowned for this (and with college admissions becoming ever so competitive given the introduction of the Common App and the increase in the volume of international applications) something to truly appreciate. As I noted previously, it is remarkable how many liberal arts colleges have produced true leaders --including several Ivy League university presidents! The photos below were taken at Lafayette College this past weekend, which has just this month hosted such world leaders as Tony Blar, Jane Goodall, and, yesterday, former President Jimmy Carter. I enjoy art and architecture and appreciate beautiful environments, which I hope that I have captured, in part, below. The photo above was taken at Lafayette Colleges' Kirby Library, which was noted as one of the most beautiful libraries in the world, and I agree! A TEDx conference was taking place on the first floor featured below The photo above the Kirby library is of the Skillman Library, another beautiful building..
We also attended a crew regatta off campus and saw Lafayette compete against Lehigh -- great fun.My college room-mate at Brown, Teresa Davila, was on the varsity crew team and I helped to start the women's track and cross country teams with Linda Tanner. We finished the day by attending a banquet in Marquis Hall at which students who participate in crew and their coaches were recognized. And, as UMass Amherst, where I teach, is celebrating its 150th birthday this year with numerous events, let me leave you with a link to the new book by Professors Max Page and Marla Miller, members of the architecture and history faculty, Beauty, Cravings, Virtue: A Celebration of the Architectural Legacy of the University of Massachusetts Amherst. Last Friday, we had our panel on how to get an academic job. The focus was on positions in operations research / management science / operations management / industrial engineering / quantitative methods. The panelists consisted of two faculty from the Isenberg School of Management -- Professor Senay Solak and me (Anna Nagurney) and two from the College of Engineering at UMass Amherst -- Professors Ana Muriel and Hari Balasubramanian from UMass Amherst.. Amir H. Masoumi, my most advanced present doctoral student, who is receiving his PhD with a concentration in Management Science next month from UMass Amherst, also participated as a panelist. The panel was on, The Process of Apply for and Securing and Academic Job, and it was organized by the UMass Amherst INFORMS Student Chapter, with the photos taken by one of its members. I began the panel by emphasizing the importance of your cv (resume in academia), which you need to start building as soon as you matriculate as a PhD student (and even before). In academia, the three dimensions of research, teaching, and service are paramount and one needs to be working on all of these aspects. I noted that Amir is my 17th PhD student and that 15 of them, upon receiving their PhDs, entered academia with 2 going into industry. One of those was first a postdoc. 9 of my former PhD students have achieved promotion and tenure and 3 are Full Professors, so I have a lot of experience in terms of the academic job market. I first emphasized research -- even as a doctoral student one should be, with the advisor's help, submitting papers for publication to referred journals. One should be presenting one's research at conferences to get feedback, experience and also to build one's professional networks.To secure a job in a Business School, it is also imperative to have teaching experience and, at the Isenberg School of Management, our doctoral students are required to teach a course over 3 semesters, with full responsibility. The cv (as well as a carefully crafted cover letter) is what search committees will see during the review process and prior to any scheduling of interviews so be very professional. Also, once you secure an on-campus interview (and this may happen only after a conference interview, several phone interviews and maybe even a Skype interview), you must be energetic, enthusiastic and very positive. The selection committee is choosing a colleague and will be evaluating you on your research (and continuing potential), your teaching abilities, and how you will fit and contribute to the department. Professor Muriel (the flow of the panel was great even though we did not script it before) then spoke on the interview day more fully and emphasized what should be included in an Engineering job talk (mention possible funding agencies and future sources of funding since this is important in Engineering Schools and not so much in Business Schools). 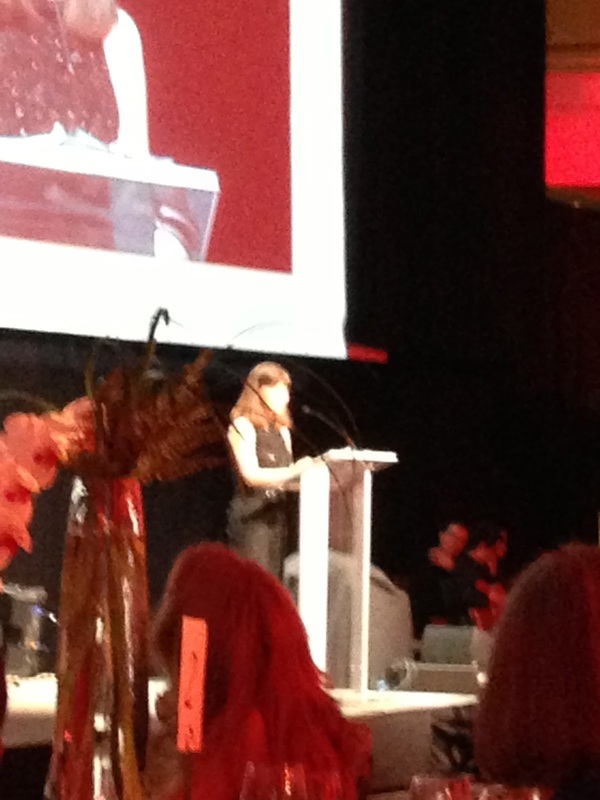 She also spoke about whether one should apply to every job opening out there or be more strategic. She noted the importance of asking good questions and knowing about the school that you are interviewing at. Communication skills are so important! Also prepare a minute and 3 minute elevator-type pitch about your research to share with those during your interview who may have limited time. Professor Senay Solak reemephasized how being a professor is the best job in the world, which I had told the audience, since one is always growing, gets to do research in areas of one's passions, and it is so rewarding to teach and see students grow intellectually, professionally, and personally. He also emphasized the necessity of being professional. He talked about the research and teaching statements, which search committees are requesting more frequently. In the research statement you should also include your plans for future research. Professor Hari Balasubramanian noted that he first had a postdoc in healthcare, after receiving his PhD, at the Mayo Clinic and how, through serendipity, he began to work in healthcare, which is now a very vibrant area of operations research and the management sciences as well as healthcare engineering and operations management. As he noted, it is important to be doing research in an area (on a topic) that there will be recruiting for. Professor Muriel had also mentioned that she was one of the first to be conducting research, as a student, in supply chains, Both healthcare and supply chains are now well-established in our profession and the demand is still very good for knowledge and research in these domains. Remember, post-interview, to thank all those who interviewed you with a followup message! Manners are courtesy matter -- a lot! Then it was time for Amir to present. He prepared the nice presentation featured below, which you can access in its entirety on this link. His presentation had some very interesting statistics as to this past year's job market. He spoke from his perspective and his personal experiences since he had done a very thorough academic job search, which was successful. One has to decide whether to respond to every job ad or to be more specific as to the type of university/college, the geographic location, and whether to apply to a business school and/or engineering school, etc. Clearly, those with engineering degrees tend to be preferred in engineering schools and those with business (or closely related) degrees by business schools. However, at the Isenberg School we have recently hired (including Professor Solak) faculty with backgrounds and degrees in Engineering. Even my dissertation advisors at Brown University had an appointment in Engineering and I have courtesy appointments now also in Engineering at UMass. It is essential to be prepared and to start planning and getting organized since the job market has been getting earlier and earlier in the academic year with ads for openings appearing in August and September even. Amir's presentation also includes locations where you can find openings, good conferences (INFORMS, POMS, DSI, etc. ), where there are interviews typically held prior to on-campus invitations, as well as doctoral consortia and colloquia which provide additional venues for networks and gathering information. Of course, to get to the academic job application stage you have to pass various exams (core and comprehensive, depending on your program requirements), complete your doctoral coursework, and successfully defend your dissertation proposal -- in other words, fulfill most of the requirements for your PhD! 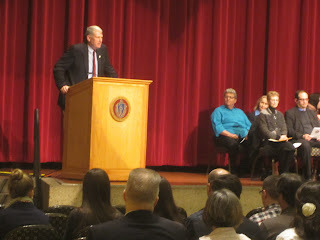 I'd like to congratulate the UMass Amherst INFORMS Student Chapter for organizing and holding another valuable event! I hope that all those who were on the academic job market this year had successful search results! I have always been fascinated by networks from transportation and supply chains to electric power and the Internet. Two decades ago, I began work on financial networks in a project that was funded through the USDA and involved Merritt Hughes (a UMass Amherst graduate alumna) and a former doctoral student of mine, who is now an award-winning Full Professor, Dr. June Dong. Since a series of papers that we wrote I have periodically returned to the financial networks theme since I am a systems thinker and it is intriguing to see how money flows and to determine analogies between/among different network systems. With Dr. Stavros Siokos, who was also a former PhD student of mine, and is now a renowned financier based in London, we wrote the book, Financial Networks: Statics and Dynamics, and it was published by Springer in 1997. In 2003, I edited the volume, Innovations in Financial and Economic Networks, and it was published by Edward Elgar Publishing. The global economic and financial crisis of 2008 and 2009 brought further attention to financial networks, systemic risk, fragility and vulnerability issues, so our research (with now Dr. Patrick Qiang) also addressed the criticality of nodes and links (and their importance and ranking) in financial networks. In 2008, I wrote a survey on financial networks which was published in the Handbook of Information Technology and Finance, edited by D. Seese, C. Weinhard, and F. Schlottmann. Invitations to speak on Financial Networks at conferences, including the Measuring Systemic Risk Conference at the University of Chicago in 2010, demonstrated the growing interest in viewing financial issues, problems, and relationships through a network prism with a focus on the system. Although those of us in operations research and the management sciences as well as in economics had realized this, the finance community was slower to recognize this. So, when the invitation from the Editor of the journal, Computational Management Science, Professor Berc Rustem, came last Spring, to guest edit a special issue on Financial Networks, I agreed, and the call for papers went out with a deadline for submission of July 15, 2013. I am pleased to report that the edited volume is now being "put to bed." The collection consists of 8 peer-reviewed papers, plus my editorial. The contributions are from academics and practitioners and cover such timely topics as stock market graphs with applications to the US stock market, Russia, and Sweden; financial contagion, dynamic network formation using game theory, financial network equilibria and corporate social responsibility as well as the co-evolution of supply chains and corporate financial networks with insolvency risk. Methodological approaches in the formulation, analysis, and computations include network and graph theory, statistics, game theory, and variational inequality theory. I will let my readers know when the volume is published -- it will be a double volume and, in the meantime, you can find and read some of the preprints already in the Online First Articles. Reviewers are essential to the quality of papers and I am so grateful to all those, who, although they remain anonymous, contributed so much with their helpful comments and suggestions to the authors on their original manuscripts and their subsequent revisions. I have returned from the Philly area. I flew back to Bradley Airport at Hartford/Springfield this afternoon via USAIR and actually had legroom and a very pleasant flight. Yesterday evening, I delivered a talk, "Networks Against Time: From Food to Pharma," at Penn State's School of Graduate Professional Studies. My host was Dr. Patrick Qiang, who is also my co-author of the book, Fragile Networks: Identifying Vulnerabilities and Synergies in an Uncertain World. The campus had done a super job publicizing my talk. I focused on models that we had developed and are synthesized and summarized in our new book: Networks Against Time: Supply Chain Analytics for Perishable Products using optimization and game theory in a generalized network framework with arc multipliers to capture the physics/chemistry of the perishability of products over space and time from food to medical nuclear products to pharmaceuticals. In my presentation, towards the end, I included a slide on our latest paper, which is a supply chain network model for disaster relief. The audience was terrific -- interesting questions -- thanks -- and some came from Delaware and Maryland. It was wonderful to speak to an audience of academics and practitioners and even the INFORMS Philadelphia Chapter had advertised my presentation so it was great to have representatives from the chapter also in attendance. Thanks to all those who came to my presentation and thanks to this Penn State campus for the hospitality! I even got to meet with its Chancellor, Dr. Ctraig Edelbrock. As I wrote in my previous blogpost, We Must Go On, I dedicated my talk to the Boston Marathon bombing victims. I had written that one friend was not accounted for. Since the post was written, I have heard that, at the 25th mile, which she had reached at just over 4 hours, she was told to stop running. This was good news on a horrific day filled with tragedy and complete senselessness and cruelty. On my flight today I especially appreciated the OpEd in The New York Times written by Thomas L. Friedman, Bring on the Next Marathon, And, the UMass Amherst sports teams doctor, Dr. Pierre Rouzier, was at the Boston Marathon as a medical volunteer -- his fifth time, and he assisted victims, as reported in today's Daily Hampshire Gazette. Also, my husband's cousin, is a faculty member at Harvard Medical School and an emergency room physician at Mass General Hospital. Speaking of Chancellors and University Presidents, as a Radcliffe Fellow, I am a Harvard alumna, and we were emailed a message by the President of Harvard, Dr. Drew Gilpin Faust. In her letter, she concluded with: The Boston Marathon is an event that demands resilience. As we struggle to make sense of yesterday’s events, I urge all of us to draw on the strength of the Harvard community and the support of colleagues and friends. 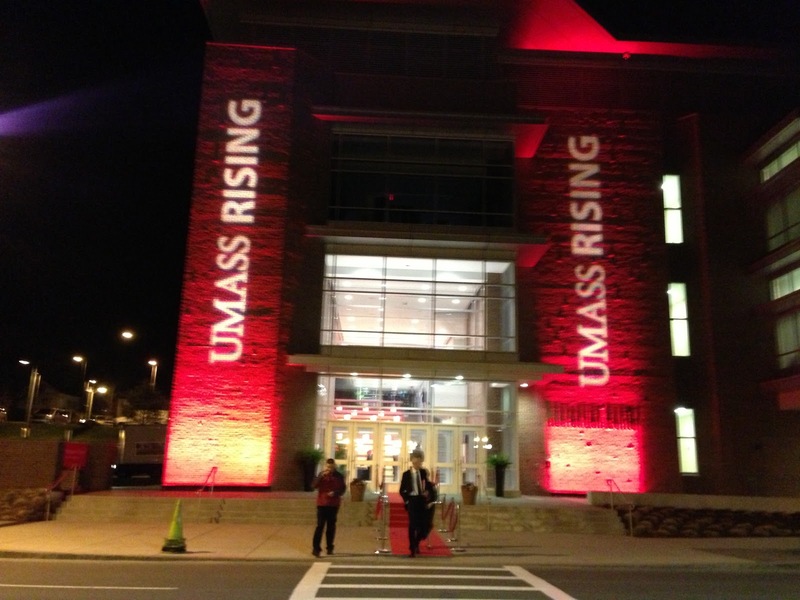 The Chancellor of UMass Amherst, Dr. Kumble Subbaswamy sent out a message to UMass Amherst. His concluding words in it were: In the days ahead we must stand together as a community to extend our support to all affected by this terrible tragedy. Such events affect all of us as citizens of the free world. Yesterday, as I was packing up and getting ready for my trip this morning to Philadelphia, where I will be speaking later today at the Graduate School of Professional Programs at Penn State, I happened to turn on the news. I was interested in an update on the Boston Marathon results. A colleague from INFORMS, whom I had met at a wonderful conference in Yalta, Ukraine, was running as well as an Amherst resident, who is a fellow Brown University alum. I had run marathons (the Ocean State Marathon in Newport, RI) but never the Boston one and the last time that I was in Boston was in mid-February, to lead the Dynamics of Disasters symposium that I had organized for the AAAS meeting, which took place very close to the end of the Boston Marathon route. The news at 3PM yesterday was "Breaking News" and now the world knows. We have gotten messages of concern from as far away as Turkey and phone calls from Washington DC. Boston is a historical and educational and architectural treasure. It is also a center for sports and innovation. It is a beautiful city. Boston, to me, is the most European city in the US and who cannot love it? As more information trickles in, and the Boston Common is now a staging area for the National Guard, and even hospitals are turning away blood donors since they are dealing with injuries that one would see in times of war and are strapped for resources, our hearts and prayers go out to the survivors, the victims, and their families and friends. I heard from my INFORMS colleague -- she finished the marathon and heard about the attacks as she was on the Green Line trying to make her way back to her hotel. Even cell phone communications were stopped for a while, as well as parts of the public transport network, and even flights at Logan. She, as all of us, was reeling from the horror and the shock. And she had just run over 26 miles in a fabulous time. My neighbor from Amherst -- I checked online -- made it to the half-way point of the marathon -- and no more news. Resilience is what carries marathoners through their journeys and dreams and we need to be resilient. This evening, when I speak on Networks Against Time: From Food to Pharma, I will be dedicating my talk to freedom and to those who have lost their lives and suffered horrible injuries because of the unexplainable explosive attacks in Boston yesterday. Amazing UMass Amherst Students and Faculty Too! 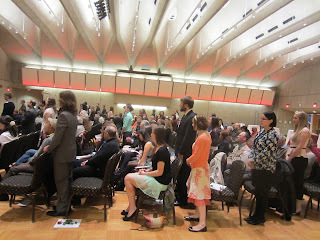 This is the time of the academic year when students, faculty, and even staff (and deservedly so) get recognized. Soon there will be additional highlights in the form of college graduations. Yesterday, I was at the UMass Amherst Campus Center to take part in a very special ceremony -- the induction/initiation of new members into the Phi Kappa Phi Honor Society. Phi Kappa Phi is the oldest, largest, and most selective all-discipline honor society and membership is by invitation only to the top 7.5 percent of second-semester juniors, and the top 10 percent of seniors and graduate students. Also, as the letter stated, the University of Massachusett's most accomplished faculty are also invited. 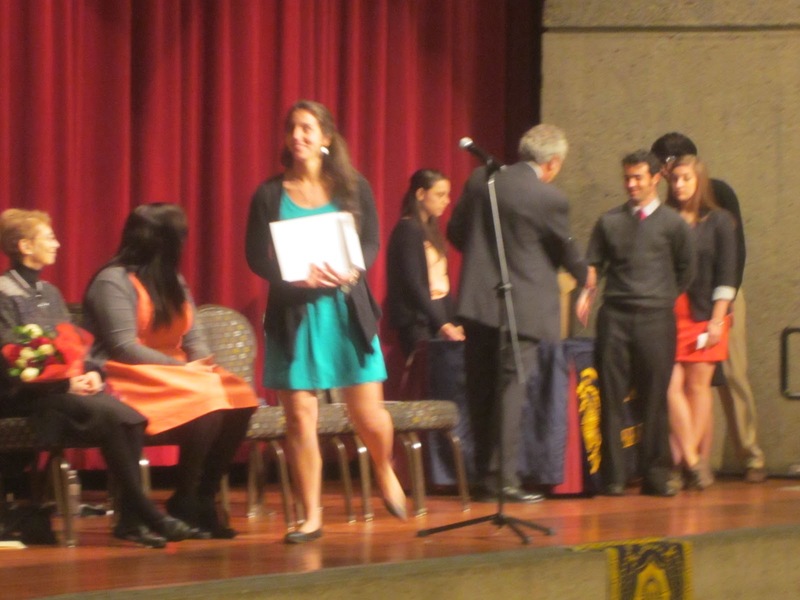 You may have heard (and even be a member) of one or more college/university honor societies, which are more discipline-specific -- Phi Beta Kappa (liberal arts), Beta Gamma Sigma (business), Tau Beta Pi (engineering), and Sigma Xi (science). Professor Don Katzner of Economics was the Master of Ceremonies and Dean Steven Goodwin pf the College of Natural Sciences gave a wonderful speech on what success means, emphasizing that it is the ride, and not the destination, that matters and noted the importance of having goals, striving towards them, and revising them. The Dean of our great Commonwealth College, Professor Priscilla Clarkson, gave Professor Patty S. Freedson a Distinguished Service Award. Dr. Freedson has done fascinating work on the effects of being sedentary on health using sensors. She has been a President of numerous scientific societies in her field, even the Sports Medicine one. And, I am so grateful for this, one summer, my daughter, as a high school student, even got a chance to help with research in her kinesiology lab. My colleague, Professor Steven Floyd, who is the Isenberg Professor of Innovation and Entrepreneurship, and I were the faculty from UMass that were inducted yesterday. The high point was having each inducted student come up to the podium to be recognized and to say a few words about their major and their plans for next summer/year. Our students are amazing -- with internships at Ernst & Young, further study being pursued at Humboldt University in Germany and Oxford University in England, many applying to medical school or to graduate school, and the majority conducting research on topics from neuroscience to pharmacology and civil engineering, on-site, or off--campus -- even at Mass General Hospital in Boston! My husband took the photos above. The certificates are gorgeous and I also appreciated receiving a red rose. I stopped by my office this morning to pick up my mail at the Isenberg School and there was a big package in my office on my desk. 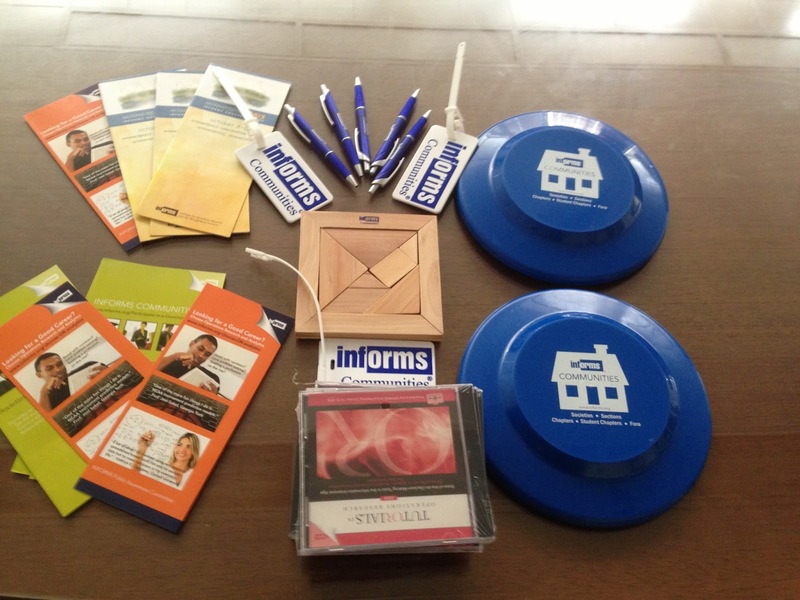 The package was from INFORMS (Institute for Operations Research and the Management Sciences). The letter inside, which was addressed to me, was from Tracy Byrnes Cahall, the Chapter Relations Coordinator. The thanks therein for my service as the Faculty Advisor to the UMass Amherst INFORMS Student Chapter are greatly appreciated, including the sentence: Your volunteer efforts help keep INFORMS alive, growing, and at the forefront of the profession! The contents of the package, which are for our chapter officers and members, are displayed in the photo above -- from CDs of TutORials to pens, Frisbees, a wooden puzzle, and even INFORMS baggage tags (I did help myself to one). There were also several documents, including the Best Practices Guide, which my former doctoral student, Dr. Tina Wakolbinger, who is now a Full Professor at the Vienna University of Economics and Business, along with Dr. Burcu Keskin, who is an Assistant Professor at the Culver College of Commerce at the University of Alabama, helped to draft. Thanks to INFORMS for the wonderful support of INFORMS Student Chapter across the nation! Students are the future of our profession and INFORMS excels in nurturing and supporting education and research in STEM and business fields! Our chapter also received a check from INFORMS of $150. Please join us for our next UMass Amherst Student Chapter activity, which takes place next Friday morning with refreshments at 9:30AM. The event is a panel of Isenberg School of Management and College of Engineering faculty at UMass Amherst plus my doctoral student, Amir H. Masoumi, who is receiving his PhD next month, on The Process of Applying for and Securing a Faculty Position. And, since I cannot resist, I would also like to, again, acknowledge the University of Oklahoma INFORMS Student Chapter for being so hospitable to me when I visited and spoke on their campus in Norma on April.1. 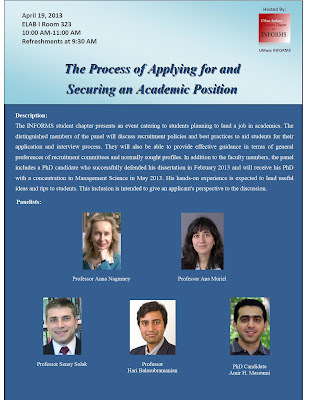 On April 19, 2013, the UMass Amherst INFORMS Student Chapter will be hosting a special panel on how to secure a faculty position in academia. The students have prepared the nice poster below for the event that will take place at UMass Amherst from 10-11:00AM with refreshments at 9:30AM. The event will be on the Engineering side of campus (not at the Isenberg School since all available rooms were booked that day). It is nice to actually have our events alternate locations since our student members come from the Isenberg School and the College of Engineering, primarily, although, not exclusively, with the latter best represented by students in the Industrial Engineering program. The message below is being circulated by the students. We will have two faculty from the Isenberg School on the panel, including yours truly, who is the chapter's Faculty Advisor, two from the Department of Mechanical and Industrial Engineering, and my most recent doctoral student, Amir H. Masoumi, who will be taking part in the graduation ceremonies at UMass Amherst next month at which he will receive his PhD diploma. The UMASS Amherst Student Chapter of INFORMS invites you to our "The Process of Applying for and Securing an Academic Position" Panel. The panelists are: Professor Anna Nagurney and Professor Senay Solak from the Isenberg School of Management, Professor Ana Muriel and Professor Hari Balasubramanian from the Mechanical and Industrial Engineering Department, and PhD Candidate Amir H. Masoumi, who successfully defended his dissertation in February 2013 and will receive his PhD with a concentration in Management Science in May 2013. The panelists will share their experiences and answer any questions that the audience may have regarding the academic job search. We strongly encourage you to come! 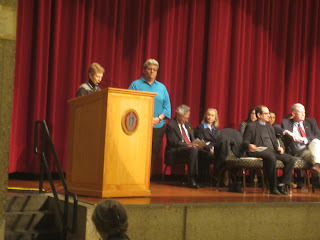 Yesterday was a very special day at the university where my husband teaches engineering -- the University of Hartford. President Obama came to campus and the logistics of his visit, his speech, and the pagentry were very special. My husband took the photos below prior to the President's arrival. Some highlights from President Obama's visit are captured here in the writeup on the University of Hartford website. You can watch the touching event and hear him speak on reducing gun violence in this video, courtesy of whitehouse.gov. His visit even made the front page of today's New York Times. And today, after my husband heartily congratulated the President of the University of Hartford, Dr. Walter Harrison, on the success of yesterday's Presidential visit, he sent the following message to the campus, which is very special so I believe it merits being recognized. Yesterday’s visit by President Barack Obama was one of the greatest days in the history of the University of Hartford. Bringing a sitting president of the United States to our campus to address one of the most important political, cultural, and moral issues of the day is what a great institution of higher learning should do, and yesterday was our day to shine. We came through with flying colors. When President Obama took a moment from his introductory remarks to thank the University of Hartford for hosting the event, and a huge roar of approval rose from the 3,000 people assembled in the Chase Family Arena, I thought my heart was going to burst through my chest. I have never had a prouder moment as president; I may never have had a prouder moment as a human being. It was not, however, a perfect event. When you agree to host a presidential event, you agree to allow the White House staff and the Secret Service to control the activity. As a result of their decisions, 2,000 of you waited in line Friday for two hours to get a ticket, and then waited in line for two hours to get into the arena. In a day of tight security, I know this is how it must be done. It doesn’t make it easy. And then, when the Hartford Fire Marshal and the Secret Service decided the arena had reached its safe capacity and closed the doors, I know that 200 of you were turned away. I can only imagine your anger and disappointment. It was their decision, not mine, but I apologize from the bottom of my heart. I want to thank the hundreds of University students, faculty, and staff who volunteered so many hours to make the day a success, especially Maria Arroyo and Aja Wilson, who led the Pledge of Allegiance and the national anthem. From the people who led the planning—John Carson, Mildred McNeill, John Schmaltz, and Lee Peters, to name a few—to the grounds crew, the Public Safety department, the Office of Residential Life, and so many more, I say thanks. And to everyone who volunteered, I extend my deepest gratitude. This is what I dream of for the University of Hartford. Many of us saw and heard things yesterday that will become memories to last a lifetime. That is part of what a great University education and experience should be. It was a great day, a day to cherish and remember. I thank you. And, in the spirit of (almost) the end to the college basketball season, I have posted the photo below, courtesy of the University of Hartford. The women's basketball team left a message for President Obama in their locker room Monday, and President Obama left a message in response. 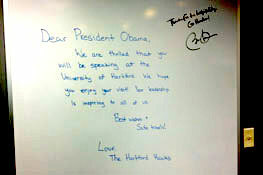 The team wrote: "Dear President Obama, We are thrilled that you will be speaking at the University of Hartford. We hope you enjoy your visit! Your leadership is inspiring to all of us. Best wishes and safe travels! Love, The Hartford Hawks." In response, President Obama wrote "Thanks for the hospitality. Go Hawks! ", followed by his signature.